Dr. Haigh has been working with Alpha, JK, Kindergarten and first grade teachers and instructional assistants and the ES/LS Administration team as a consultant this year. The first workshop will be an introduction to the Reggio Emilia Approach. Presenation 1 on January 15: Video may be found here. Presenation 2 on March 19: Video may be found here. Karen M. Haigh, Ph.D. is currently an early education consultant. She is a former Associate Professor in the Early Childhood Education Department of Columbia College Chicago. While there, her areas of interest included Reggio inspired principles and practices in an American context, with a particular focus on the classroom environment, the role of materials and languages, documentation, listening and observing to development of emergent curriculum, parent partnerships, collaboration, and professional development. She continues to study action research, professional development, and emergent curriculum development within her current projects involving public and private schools and community-based organizations. 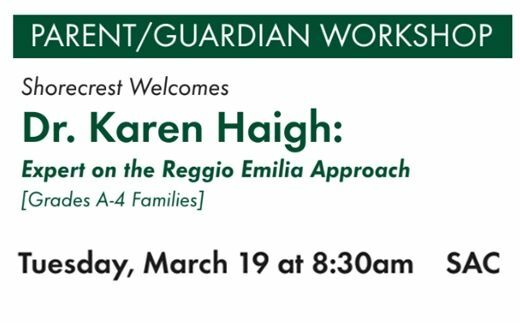 Dr. Haigh has traveled to Reggio Emilia numerous times, often leading groups of educators there. She has worked closely with well-known Reggio leaders, including Lella Gandini and Amelia Gambetti for many years. Dr. Haigh has co-authored "We Are All Explorers: Learning and Teaching with Reggio Principles in Urban Settings." She has also contributed chapters/sections for the books "Insights and Inspirations," "Next Steps Towards the Reggio Way" and "First Steps Towards the Reggio Way." These works relate to her past position and experiences as an administrator at Chicago Commons, which had focused heavily on the Reggio Approach. Additionally, she has written articles for "Theory Into Practice, Child Care Information Exchange and Innovations in Early Education." Dr. Haigh has worked as a teacher of young children, an education coordinator, and a program administrator within Chicago Area Social Service organizations. Additionally, she has worked as director of professional development for the Chicago Public Schools Early Childhood Education Department.